Let me introduce you to a happy man. All too many people in Portugal tolerate their jobs rather than love them. There are graduates, for example, who are working as waiters and waitresses because there are no other job opportunities. They know that as the years roll by, and new graduates begin their job search, older graduates will be less and less likely ever to find a suitable post. There are perhaps as many who have no jobs at all. The employment situation for the young is discouraging and many are depressed and unhappy. The only way around this is, perhaps, to be entrepreneurial; to find something you love and start your own business. This is easier said than done, of course. Sr. José Fernando, whose workshop and sales outlet is on the Muro dos Bacalhoeiros – the Cod Fishingboat Wall, a walkway by the River Douro - could perhaps be a source of inspiration. To find out what Sr. José does and and to see some of his work, click here. 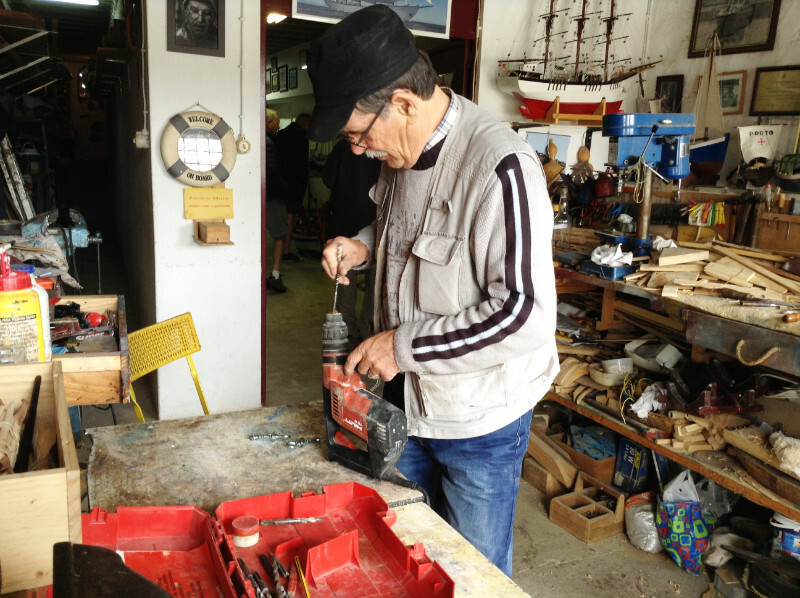 Sr. José Fernando seems to have turned a hobby into a successful occupation. I don't imagine he is financially well-off, though I assume that his craft pays his bills. What I am pretty sure of is that putting his skills to work makes him content. Anyone for whom work is an extension of play may, I think, be counted as lucky. Having enough money for food, accommodation, education and so on is necessary for happiness but satisfaction in work is an important, sometimes underestimated, kind of wealth. 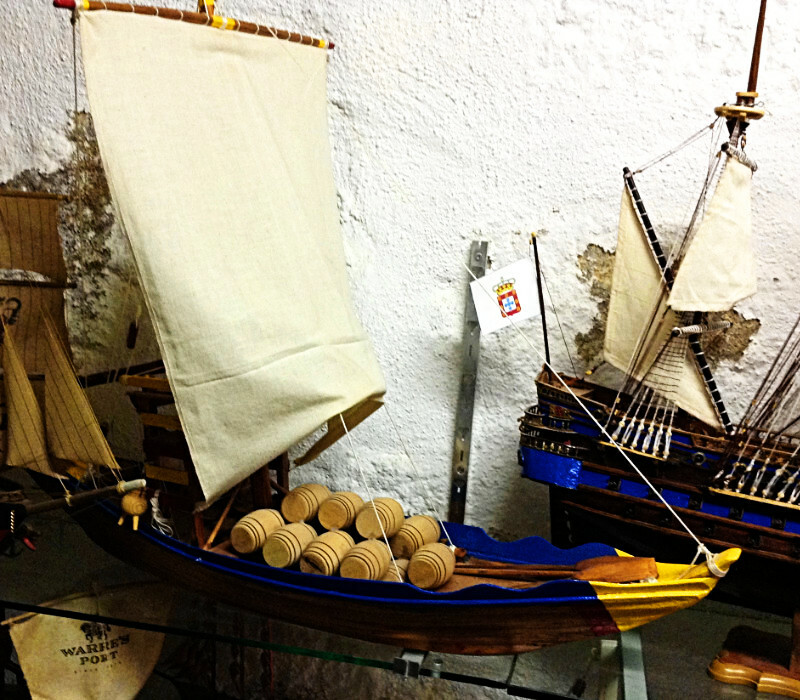 These model ships, fully rigged and in full sail are all made by Sr. José. Aren't they lovely? Wouldn't you like to have one of these gracing your home? When my home is complete, I would like to buy a model of a rabelo, the shallow-bottomed boat which used to bring the wine barrels down from the vineyards on the banks of the upper Douro River to the wine cellars in Gaia on the southern bank opposite the Ribeira where Sr. José has his workshop. Rabelos are quintessentially Portuguese though they are only a tourist attraction these days. They can be seen moored along the southern bank of the Douro to the west of the the Dom Luís I Bridge. Sr. José Fernando's sailing ships and boats come in a variety of sizes and the prices reflect this but, considering the work that goes into them, none is really expensive. And for you, what price the satisfaction of an article of craftsmanship? Maybe there are little imperfections but doesn't that add to the charm? Mass produced objects, whose design has gone through many generations so that all the mistakes are ironed out en route, are sterile by comparison. If you delight in the sea and sailing ships, one of these models might be for you – or how about as a present for a dear friend or family member? Your only problem is going to be how to get it home on an economy airline!